Unless you are not someone who consumes motivational materials, Tony Robbins is someone everyone should know. He is an author, philanthropist, and life coach who has coached some of the biggest names in the world, including Oprah Winfrey and Bill Clinton. The one, however, who is not so much known is Becky Robbins – Tony’s ex-wife. The two had been together for over a decade, from 1984 to 2001, before their marriage came to an end. Here is a little light on her life. Becky Jenkins Robbins was born and raised in the United States. She was brought up in an academic environment and because of that, she did not only take her educational pursuit serious, but she also took an interest in music and literature. At around the age of 18, Becky got married for the first time. The marriage produced three children; two sons and a girl, but it still left her empty. The marriage did not last forever, but it is not known when exactly it came to an end. Becky realized that her life was not going the way she wanted it and so scared for the future, she decided to find ways of improving it personally and professionally. 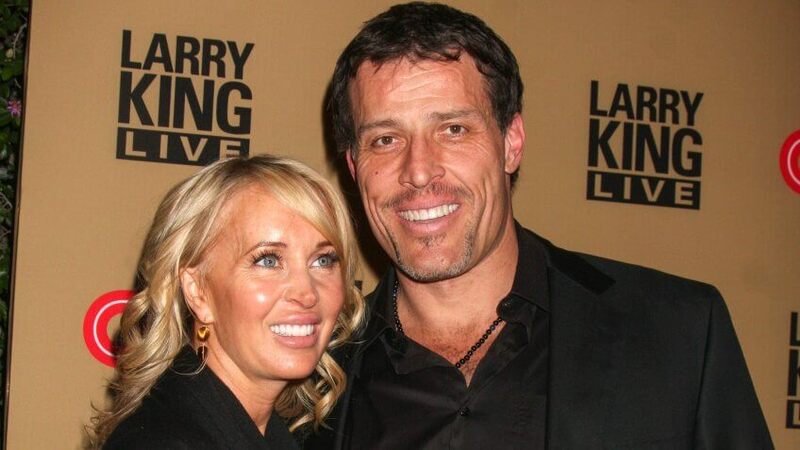 This was the urge that drove her to attend the “Unleashing the Power Within” seminar by Tony Robbins. Standing at six feet seven inches, Tony saw Becky sitting in the front row of the seminar and he was immediately smitten by her beauty. She also fell for him because of how fearless he was, willing to take any adventure that came his way. In 1984, the pair got married and the motivational speaker adopted her kids. Even for a life coach as good as Tony, who seems to have everything figured out, life can prove that it is not always that the formula works. Or maybe he applied the wrong formula when he got married to his first wife, Becky Robbins. According to him, he knew from the beginning that the union was not going to last forever, but being someone who has built his life and career on pleasing others, he decided to please Becky by going on with the marriage. When they first met, Tony was only 24 while as stated, Becky had already had three children. Her eldest child was 17, the second was 11, and the third was 5. Although he felt deeply not to continue with the marriage, he went against his mind and for the next 14 years, they stayed together as man and wife before he decided they should go their separate ways. Their divorce was finalized in 2001 and then he got married to his then-girlfriend, Sage Robbins. Of course, this did not go without attracting the rage of many of his followers who felt betrayed that for a man who was into teaching them on how to forge relationships, he should never have ended his marriage. However, he explained that although he was always a husband to Becky Robbins and a father to her children, he realized they did not share a vision and so he had to leave. An acupuncturist and a phlebotomist, Sage first got married in 1992 to John Lynch with whom she remained until 2000 when the marriage ended in a messy divorce. There are speculations that she ended her marriage because of Tony whom she met in the same year at a business trip. There is credence to this because her ex-husband described Tony as a wife thief. When Becky and Tony got married, they both had children from their previous relationships. While she came in with three, the life coach came with a son, Jairek Robbins who was born to him by Liz Acosta in 1984. Just like his father, Jairek is also a life coach and motivational speaker. In spite of the divorce, Becky and Tony are still friends. Even when the marriage had ended, she still worked with Robbins Research. When it comes to her net worth, Becky Robbins is not someone whose life is open to the media and the public. Because of this, her net worth is not known. However, Tony who as pointed out was her husband, has a massive net worth that is estimated at over $500 million. There are no details on any form of settlements when they ended their marriage.